Untreated tooth decay can lead to painful root canal infections. Root canal infections must be treated to prevent further decay and tooth loss. Dr. Byron Wall offers the latest treatments to restore the health and beauty of your teeth at his Albuquerque cosmetic dentistry practice. Root canal therapy is the leading treatment for root canal infections and just one of the many treatments offered by Dr. Wall. 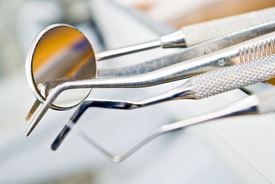 Read on to learn about root canal therapy and how this treatment can improve your oral health. Root canal therapy is used for treating root canal infections. A root canal infection occurs when the nerve and pulp tissue within the center of the tooth, the root canal, becomes infected. These tissues become infected through tooth decay or trauma. Root canal infections are very painful and can lead to tooth los, as well as abscesses. An abscess may form when pus from the root canal infection spreads to the bottom of the tooth's roots, into the gums or even the cheeks. Root canal infections can lead to facial or neck swelling and even bone loss. This is why root canal therapy is so vital. Root canal therapy is performed by removing the infected nerve and pulp tissue. Steps are taken to fully clean out the infected tissue and damaged tooth. Once all infected tissue and decayed areas of the tooth are removed, the tooth will filled to prevent further infection and decay. For some of our patients in Albuquerque, dental crowns are necessary after root canal therapy. In some cases a large amount of the tooth must be removed during treatment, leaving tooth weakened. A dental crown can be placed to restore the tooth's appearance and protect it from breaking. You can reduce your risk of root canal infection by taking precautions to prevent dental problems. Most root canal infections are a result of tooth decay. Brushing twice a day, flossing once a day, and seeing your dentist for twice yearly check-ups can dramatically reduce your risk of developing root canal infections. You can also reduce your risk for needing root canal therapy by seeking treatment at the first signs of tooth decay. Though tooth decay is the leading cause of root canal infections, other conditions can cause the nerve and pulp tissues to become infected. Trauma and fractures can allow bacteria access to the tissues within the root canal, thus causing root canal infections. You can avoid the need for root canal therapy by seeking treatment as soon as you experience dental trauma or notice a crack or fracture in your teeth. Schedule a Consultation with Dr. Byron Wall Today! Don't let tooth decay or a root canal infection go untreated. Untreated dental problems can lead to major issues like tooth loss, bone loss, and painful infections. Don't live in pain or embarrassment, seek treatment today! We welcome you to schedule a consultation with Dr. Wall for your individualized treatment plan.